Here is another one of my favorite summer time recipes and a great substitute to replace those “white carbs” and its really good! This recipe is easy to make and its a great colorful dish to serve as a main course or as a side. You can even get creative and pop a fried egg on top. Enjoy! In a bowl, add the black beans, corn, onions, and cilantro. Stir to combine. In a smaller bowl, mix together the lime zest and juice, oil, honey, adobo, salt and pepper. Pour over the black bean mixture and toss to combine. 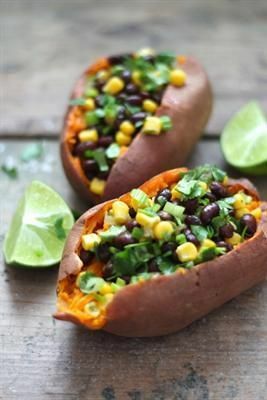 Slice open the baked sweet potatoes ( you can put them in the microwave for 10 min. Make sure you poke them first so they don’t explode!). Stuff potatoes with the Chipotle Black Bean & Corn Salad. Serve. *Fresh corn is best, but when out of season, frozen (thawed and cooked) or canned is fine. If using canned, be sure to rinse and drain thoroughly. ← A Great Anniversary Day!